Dimensions 0.75 by 9 by 10.75 in. Amazon.com description: Product Description: More students learn from John Santrockâs Adolescence than from any other text in this field. 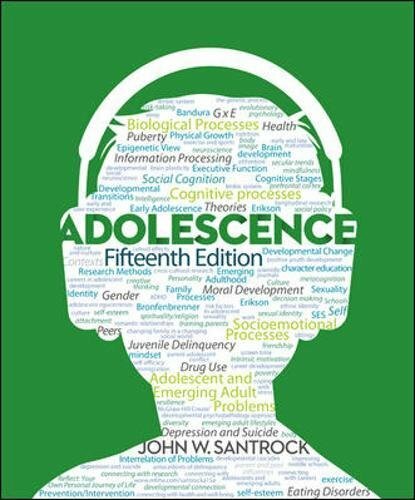 The 15th edition combines proven pedagogy and the most current research to provide a market-leading presentation of adolescence. This time-tested text provides compelling contemporary research, including updates from a multitude of leading experts in the field. The text's accessible presentation, plentiful applications, and engaging writing foster increased mastery of the content. The new edition continues with the âConnectionsâ theme, guiding students to connect topical processes in development, connect research to what we know about development, and connect development to the real world. The new edition also includes substantially expanded material on diversity and culture, adolescentsâ and emerging adultsâ health and well-being including numerous recommendations for improving the lives of adolescents, and expanded emphasis on the positive aspects of adolescent development.